You know that look you get from people and you just know that they think you're absolutely crazy? Well a few weeks ago I got that look and then some from a checkout girl at the grocery store. You see, I was shopping with SIL Mama and we were waiting in line at the checkout when an idea hit me. 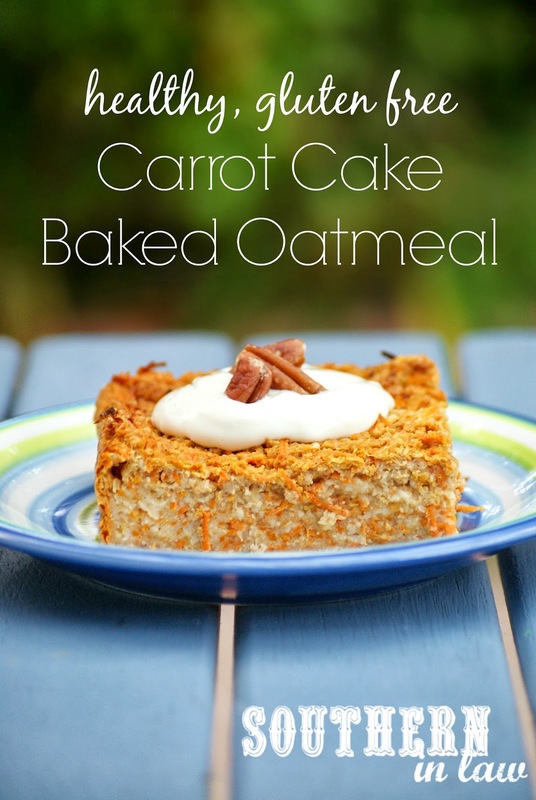 "Carrot cake baked oatmeal - that is what I'm baking for breakfast tomorrow!" I said. "Hmm, interesting - but it could be good" SIL Mama replied. Just as the checkout girl started scanning our groceries she said "Carrot cake baked oatmeal? Now that is the weirdest thing I have ever heard of... how do you even make that" whilst giving me that look. 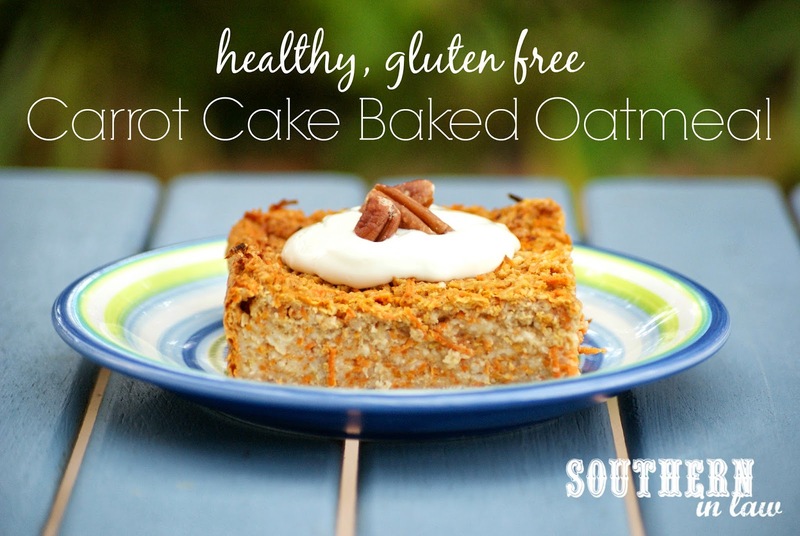 Well I'll tell you what, doubtful checkout girl, this Carrot Cake Baked Oatmeal Recipe is incredible - and it makes your house smell amazing. So amazing that Jesse roused from his little computer cave and begged me to share. I kinda wish I hadn't agreed to share with Jesse though.... because that meant less for me :P We both took one bite and instantly became obsessed - and we've made it multiple times since. Line an 8x8" baking dish with baking paper. In a large mixing bowl, add your carrot, oats, baking powder and spices. Pour in your milk, applesauce, vanilla and egg and mix to combine. Leave your mix to soak for 30 minutes to absorb some of the liquid and fluff up the oats. Pour into your baking dish and bake for 45 minutes to an hour or until set and golden on top. Serving: Serve chilled or warm, depending on your own preferences. We like to top ours with a simple "frosting" mix of reduced fat cream cheese and a touch of maple syrup. Storing: This baked oatmeal recipe freezes well (individually wrapped and stored in a ziplock bag) or will keep in the fridge for ~2 days. This baked oatmeal is very moist - but that's why we like it! If you'd prefer it to be a little drier, use only 2 cups of shredded carrot and reduce your baking time (as it won't need as long). But tell me, when's the last time someone gave you "the look"? And do you have any Easter Traditions? Each year we have a seafood feast on Good Friday and we usually like to make some sort of Easter Cupcakes or something with an Easter theme - I need to get my thinking cap on for this year! ohh this looks great! thx for sharing! I'm not sure why anyone would think it sounded weird. Had I heard you say it, I probably would've asked you to bring me a piece.. strange or not :) Ha Ha! Haha that's what I would have done - if I was someone else, that is hahaha. Made this and it was great! Thanks for the recipe!